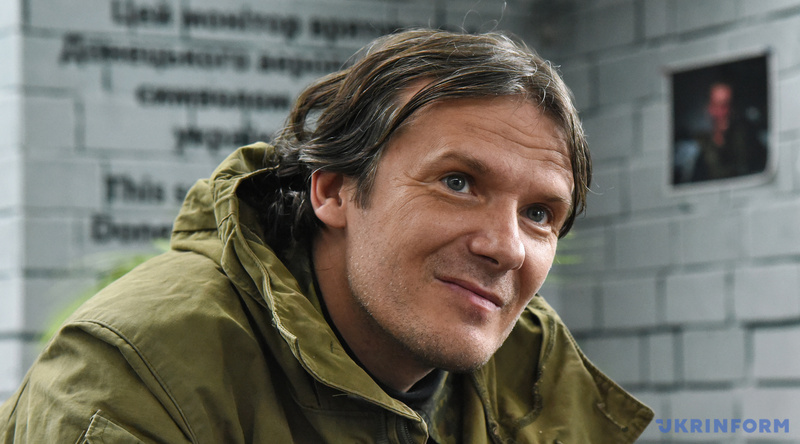 Let him say in one paragraph: "My country, excuse me..."
Cyborg Mykola Voronin is on hunger strike at Boryspil Airport, demanding apology from Volodymyr Zelensky, and hopes to vote in the second round of the presidential election. There are not many people at Boryspil Airport. 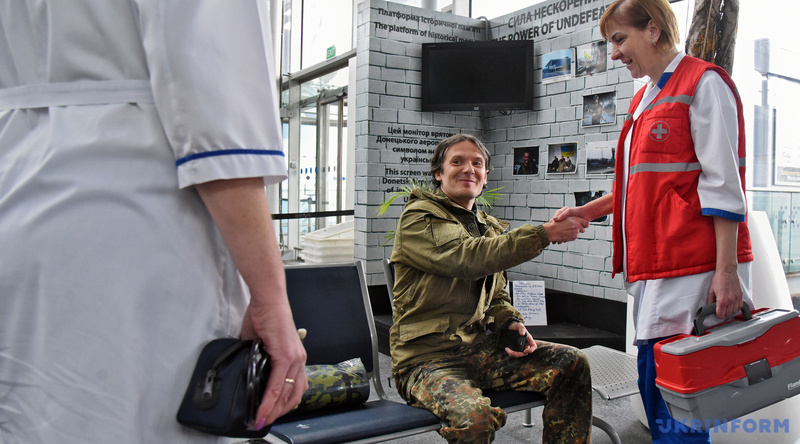 Mykola Voronin, a 39-year-old war veteran who defended the Donetsk airport, can be easily seen. He is to the left just at the entrance to the central terminal. 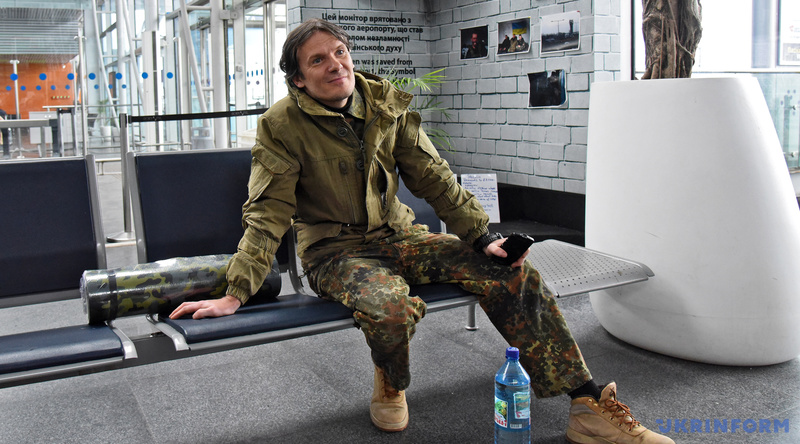 Behind him, in the corner, there is a TV monitor, which he brought from the Donetsk airport and presented in it to the Boryspil airport in 2015. Pictures of cyborgs can also be seen there. Voronin is the man who demands that Ukrainian presidential candidate Volodymyr Zelensky apologize for his insults of the heroes of EuroMaidan, Heavenly Hundred, the faithful of the Orthodox Church of Ukraine, for jokes about Tomos, and he declared a hunger strike. Together with photojournalist Olena Khudiakova, we are going straight to him – a young and athletic man, smiling, and he is not alone. There are also several people who came to support him. Question: Mykola, we read about you, spread this information and wanted to see you. The first question is why you decided to protest in such a way? After all, many people are outraged by the behavior of Zelensky, but are not going to risk their health because of this? Answer: I am an active person. An active participant in this war. I was a volunteer in the Donbas Battalion, then served as a paratrooper in the 79th Air Assault Brigade and then in the 73rd Naval Center of Special Operations. I see the situation in the country, I see ratings, and I am worried that Volodymyr Zelensky can become our president. I see serious perturbations and instability for our state. I'm sure that very serious, complex transformations that it needs will not succeed. Very bad times will come to our country. That's why I thought about what I could do about it. 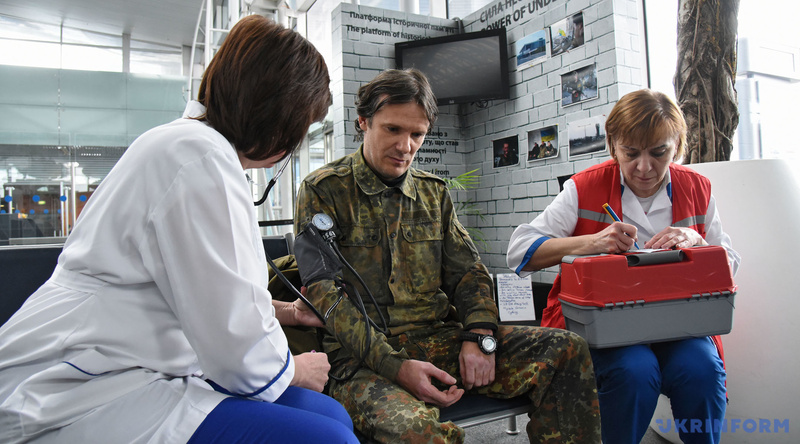 I decided that I could declare hunger strike for the sake of Ukraine. Q: How long have you been on hunger strike ? A: I started hunger strike at 11:00 on April 11. So it's the fourth day already. I am drinking water here. Q: Does anyone bring water to you? A: I brought some water with me. Then people read my posts on Facebook and began to come and bring water. They brought a sleeping bag, because it was cold last night. I started to cough a little. I think it will not be that cold tonight. Q: Do you need some other help? A: Maybe just information help. It is necessary to spread this information. This is the main thing why I am doing that. In general, what I need is not now. I need help because I have an entire center. It's NGO Center for the Integration of Veterans. I created it and I'm leading him. It is located in Kyiv. Q: How long have you been doing this business? A: The center was created recently. I studied at a school of strategic architect at Kyiv-Mohyla Business School and developed a concept that should help veterans. I have a plan. I want to provide them with solar power plants, because many of them have no money to live after returning from the war and thus I want to help them, and not only them. Actually, I have a lot of plans. This is a whole concept called "We Care Together." I planned that we all should act together to help veterans. I hope that I will survive in this rally and realize my greatest and most important plan. If someone wants to help me, I will be glad about any help! Q: Well, one way or another, this rally must be stopped, at least from the date of the announcement of the winner's name in the second round of the election. That would be logical, wouldn't it? A: If I live until that time, then it will make no sense to stay on hunger strike even during the election, because I plan to vote myself. I plan to vote for Poroshenko! And it is quite possible that my one vote will mean something. I do not know if there is strength enough until that time, because it's not that easy. Q: Where will you vote? At which polling station? A: I'm not a resident of Kyiv. I live in a hostel of the Kyiv-Mohyla Academy. I got registered in advance at a polling station close to it. Q: Cool. How do you earn money? A: I get a scholarship of UAH 4,000. I am a postgraduate student at the Kyiv Mohyla Academy. I will have a diploma in two years. The theme of my dissertation is "Peculiarities of the Motivation of War Veterans in the Period of Post-Extreme Adaptation." I want to help the veterans because they really need help. There are many methods of treatment, but the problem is that veterans do not seek psychological help. This is precisely the topic of my scientific research. Q: Who supports you in this business? Is there a team in your center? A: This organization consists of two people at this stage. This is me and my friend who helped me all the time during this war, where I have fought for five years since the spring of 2014. Q: But now here, at the airport, you are sitting on the bench. Do people come and ask you why you stay here? A: No, it's only now that they started to come. Prior to that, I was sitting here mostly alone. Q: What do you think about when you stay alone? A: About many things. About plans, a scientific article that I have to write. It would have been easier for me to have a socket out there because I have a laptop and I could have worked. However, the airport administration is not very active. Q: By the way, did the airport administration offer you any help? Was there any kind of medical service? A: No, nobody came up here. Journalists from Channel 5 and Priamy came to me. They have recently departed. 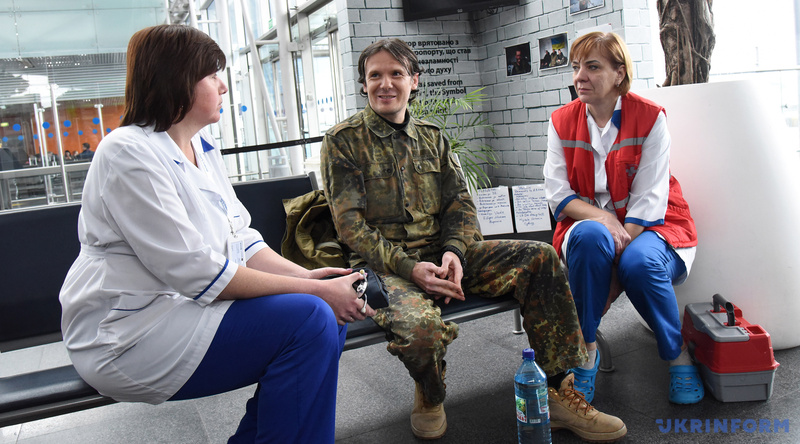 But then our conversation was suddenly interrupted - two young women in white dressing gowns came up to Voronin: "We are the medical service of the airport. We learned that there was such a man here, so we decided to come and ask him about his health." So, waiting for Voronin, I continue the conversation with a pretty young woman sitting next to me. It turned out that she came here with her husband and just learned about this rally from Facebook. "I am a doctor myself. I'm Tetiana Popova," she says. "Voronin is just my Facebook friend. I saw his appeal and evaluated the situation. Unfortunately, not on the first day of hunger strike, but I have just read, so we are here. We live nearby, we got into our car and came to support Mykola, see how he feels. Fortunately, I see a person in good humor. I brought a blood pressure monitor. I wanted to check at least blood pressure." Medical workers are going to leave. We ask them: "What's the condition?" - "Stable. Satisfactory." So I'm returning to Mykola. Q: What did the doctors say? Did they measure your blood pressure? A: They measured blood pressure. They asked me if I'm complaining about something. I told them that I was fine, except for pyrosis. They assured me that I can call them at any time. So, if I need medical assistance, they are ready to provide it. But I hope that it will not be needed. Q: Mykola, do you think that information about you came to Zelensky? Do you hope he will respond somehow to your protest? A: I hope that news come to him. I do not need him to come here. I would like him to apologize in public. Let him record a video - he has advertisers – so that it is shown to people. I have the Internet here, I'll see. I am ready to stop this rally when my requirements are fulfilled. Let him apologize to the people of Ukraine. There are four apologies. Let him say in one paragraph: "My country, excuse me..."
Q: One of your demands is that apologies be made to Luhansk poet Vasyl Holoborodko, whose name is used by the character Zelensky plays in the series "Servant of the People." Did you watch the series? A: I started to watch the first season, but I did not like it, so I stopped watching it. It's hard to perceive, because it is immediately apparent that this was done to brainwash the people. And this can be seen at every step! We see now that it is effective because he received 30% of the vote! Q: We can only hope that your act will somehow influence people, and they will change their mind when they go to the polls. A: I also hope so. However, there are so-called Zelensky bots, as young people call them, and you cannot convince them. Threats are coming from them on Facebook. They write that they will come and tear me here. But I'm here - on my own territory. Q: Did the police pay attention to you? A: No I just saw them passing by. None of them came up to me and communicate. Q: Is this monitor the one you brought from the Donetsk airport? A: Yes, I brought it from there. It has become a symbol of invincibility. I passed it to the management of this airport, and they developed this stand as a platform of historical memory. People can come here and look. Q: Are these photos of fighters? A: No, these are not my photos. I did not have high-quality photos from the Donetsk airport. These are photos taken by Serhiy Loiko. The administration created this corner three years ago. There was a presentation here, journalists and an orchestra were present, when I passed the monitor. Q: Everything will be fine, no matter who becomes president. You will graduate from the Kyiv Mohyla Academy and you will work there. A: I don't have such plans. I hope that I will develop a serious method that can be implemented, that my organization will grow so much that it will be able to make a real contribution to helping war veterans. I also hope that we will win. We need a victory. Ukrainian victory. Ukrainian language. Ukrainian culture. Not the "Russian world." Q: You must guard yourself for the sake of such a matter of noble goals. We read the statistics, how many people coming from the war cannot find themselves in life, in this reality, where people sometimes do not even mention the war. It is difficult for them, like you, to accept it. You can really help these people, so is it worth risking your health and life? A: Why not? Frankly, I ran even greater risks. I risked in battles. Q: Don't your parents worry about you? Don't they feel sorry for you? A: I have a father, mother, sister, brother. They support me. They believe that everything will succeed. My mom is now in Italy. My dad has problems, unfortunately. He had a road accident the day before yesterday and is now in hospital in Kherson region. I called him, he said that I should not leave this. My sister is now with him. Q: Let God give health to him, your father. And let God help you. A: Let him help everyone. Whole of Ukraine. And you can support me, with information.